6 Question? Ask a virtual advisor. 11 Are you studying in Germany? Share your experiences. Here we provide you list of colleges where Indian students are studying and they can provide you an insight in the real life information. The information can be about admission procedure, hostel life, job market, placement and anything relevant to student life.. NOTE: We don't provide any personal guidance on admissions in Germany, so don't send any query about the same. Go through this page and websites listed for complete information. Every university has their own acceptance policies and requirements. So please go through the website of college of interest to know about the same. Please visit following link to get answers to few FAQs. Question? Ask a virtual advisor. DAAD is also providing virtual advisor, click on the link below to chat. 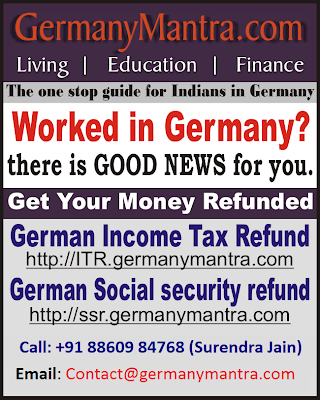 All Indian nationals who wish to travel to Germany for studying purposes require a visa prior to their departure. Important note : It is prerequisite to have a blocked account in Germany to apply for German Student VISA. So it is advised to apply for the same in advance without waiting for Admission confirmation. More details about this in next paragraph. Please print out the attached forms, fill in all necessary fields and sign them in person exclusively at a German Embassy in order to receive a confirmed account opening document and passport copy. This card may be helpful for accommodation etc. Please refer to website. Are you studying in Germany? Share your experiences. If you are an student or have been there, and you can think you can add value to this website, please write to us and we can allow you to add information. Christian-Albrechts University, Kiel Kiel The CAU has established innovative, high-level support programmes for young academics involved in both pure and applied research, e.g. special summer schools, Masters and doctorate programmes taught in English.